It's my 29th birthday today! I've taken the day off to hang out with John. We're going to Fredericksburg to pick strawberries & hit up a winery. Then it's back home for meatfest at a Brazilian Steakhouse downtown. It's a pretty good way to start the final year in my 20s. Guys, I've been in a writing funk lately. It's not that I have no content. It's more of a lack of motivation. I have a ton of half written stuff that I can't find the energy to finish. That's really what it is, lack of energy to devote any time. It's also not helping that I'm insanely sleep deprived after I forgot that I'm too old to stay up all night. Yes, Saturday night I was insane & didn't go to bed until 8 am Sunday morning. 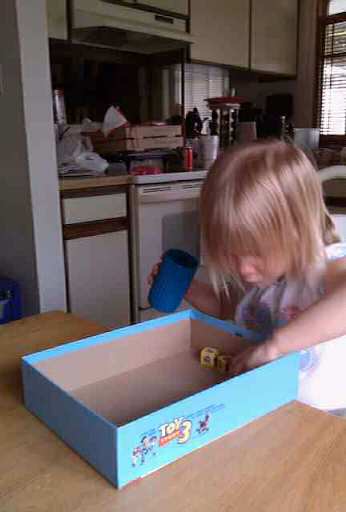 Then I got up 3 hours later to spend time with my brother, niece & nephew. As sleep deprived as I was I'm so glad that I did because the two of them were just so much fun. It's been a long time since I've had just some one on one time with them. While we ate lunch the two just talked and talked. I can never get Lizzie to acknowledge me until I'm walking out the door & Ben's favorite and almost only word to me was no. It was amazing. Lizzie even let me cuddle with her and read her a story before her nap. It was well worth the total lack of sleep I got! Oh yeah. 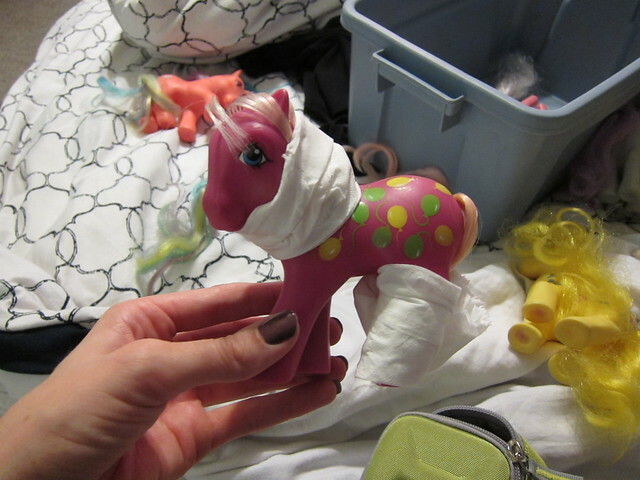 Last week I spent some time in the Pony Salon. 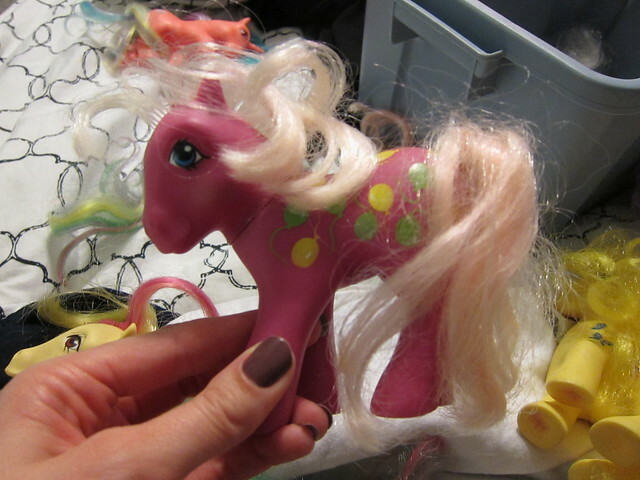 Want to know how to get pen off a pony (or any plastic toy or doll for that matter)? 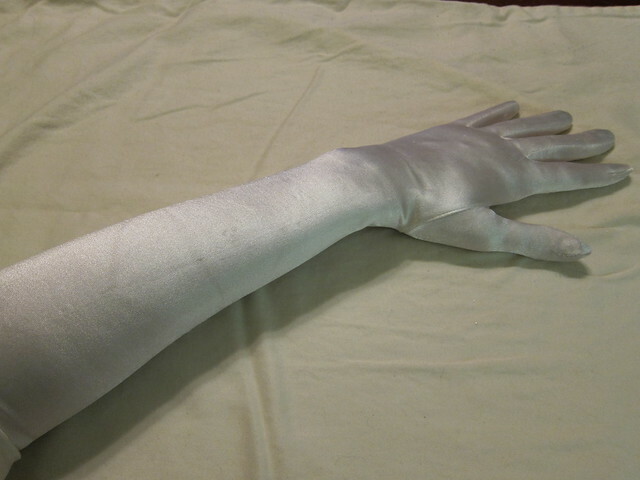 A little bit of zit cream and several hours under a lamp! That's how! If you didn't watch that awesome video above, a trip to the Pony Salon involves taking a pony that says, "Hi, I've spent the past 20 years of my life in a box." And then you wash her really good with some dish soap and a toothbrush. Then you have to squeeze the crap out of her so all the water comes out. When you're done you give her a deep conditionioning treatment. After about 5 minutes or so you comb out her hair and rinse the conditioner out. And then (and yes I actually did this) you take your hair straightener and straighten her hair. No it does not melt, but you need to use the lowest setting and only run it through once. The final step, in order to give your pony that perfect pony curl in her hair, you wrap her mane around her neck and her tail around her leg. Then you secure it with 3 pieces of folded up toilet paper. Then let her hang out with her pony friends while her hair dries overnight. The next day let her loose and check out that beautiful pony curl. 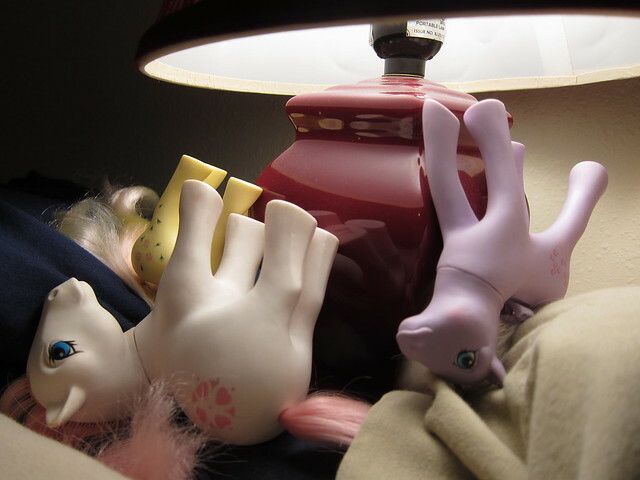 Oh and since I don't want to put the ponies BACK into the box they're currently spread out around the bedroom and totally creep John out. Hopefully this'll be done soon. I've done some basic research and do have four or five ponies that are worth about $10-15. I may try selling those individually and then the rest as a lot. We'll see! I have these things called punctal plugs for dry eyes. They're these little things that sit in my tear ducts. On Sunday I rubbed my eye and felt like I pulled on it some. For the past two days my eye has hurt. It's been itchy and a little swollen around the tear duct/plug and my inner eyelid has been really red. 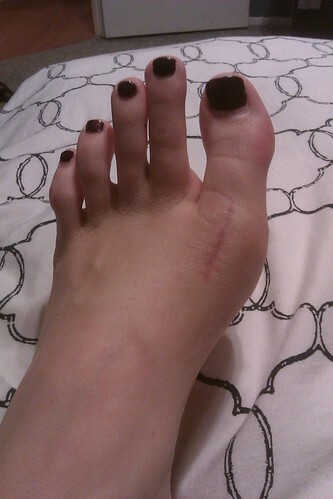 Today it was painful so I decided to head over to a Urgent Care clinic during lunch today. Now I knew that the wait would be long especially during the lunch hour. I waited for about and hour and a half in the waiting room and when I was taken back I sat in the exam room for about 45 minutes while the Drs and assistants all had a pizza party with a drug rep. Seriously!? It was right outside my exam room. Either take care of your patients you have back there or don't bring them back. Then when the Dr. came in he put some dye in my eye and looked at it and said I have some conjunctivitis in my eye. I ask, "pink eye?" 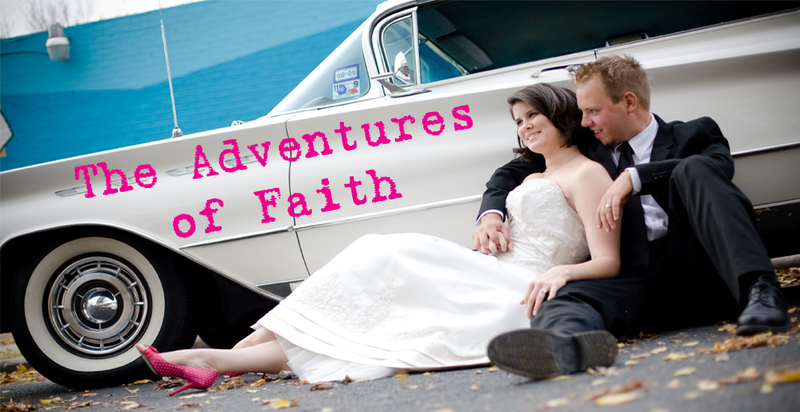 and he said, "well, that's kind of a loaded question." Either I do or I don't. Come on. When I asked about the plug and if it was something to do with that he basically said he didn't know anything about them and they were way out of his scope. He said that he'd refer me to a opthamologist so I could ask whether or not having an eye infection would effect the plugs in any way. I asked about being contagious and he said, "Well, most workplaces won't let you work with pink eye." Ok.....so I do have pink eye? He said that I couldn't wear my contacts anymore and he'd write me a note about missing work for a few days. So then he leaves to "do some paperwork" and I hear him in the hall, "yeah, she's got these weird plug things in her eyes." Ok...thanks for sharing my weird plugs with whoever that was. Then a nurse or assistant comes in with a prescription and some information on pink eye. No note. No referral. Then she hands me a discount card because one of the prescriptions is really expensive. I ask about the other information and she just looks at me like I'm crazy and says that the Dr. didn't give her anything else. So I just left. I swung by work to grab a few things and tie up a couple loose ends since I wasn't exactly expecting to be gone for almost 3 hours or be gone for the rest of the day. Plus I figured I'd already infected my office. I leave to go fill the prescription. On my way I call my eye Dr. who I saw almost 2 months ago to get new contacts. (I "think" I have one pair left of my old script) but my trial pair of my new script has been on back order. I wanted to see if the contacts are EVER going to be in and ask about the punctal plugs and pink eye. Of course they say they'll need to see me to tell me anything and they have an appointment in 10 minutes. I'm almost at the pharmacy and 1 exit from the eye Dr. So I stop at the pharmacy and ask if there is a generic for the one (surely there would be since pink eye is super common right?) the pharmacist looks at the script and says she's never even heard of it. She looks it up in the computer and says there's no generic and they don't even have it in stock, she'd have to order it and it won't be there for another day. I tell her, "that's fine, I'm about to go to my eye Dr. and I'll see if he can give me something else. 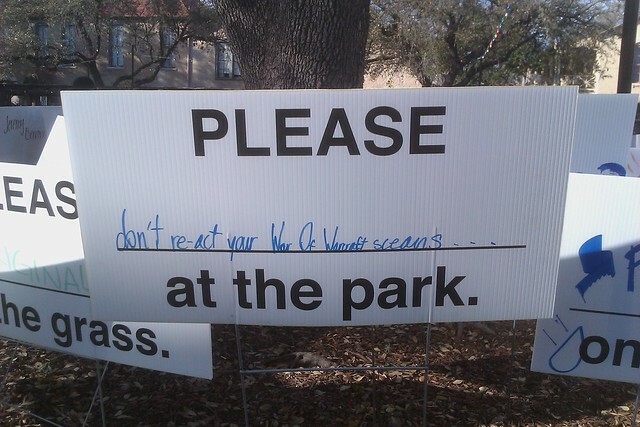 The one that wrote this one kind of pissed me off already." After another hour of waiting at the eye Dr (again, expected since they squeezed me in, but crap, I spent almost 4 hours of my life today in Dr waiting rooms) I go back. She does the same dye test and says, "You don't have pink eye. You definitely have some allergy gunk, but it's not pink eye." I asked about the swelling and she said it does look a bit irritated and said that I may have disrupted the plug a bit and that could be what the pain and irritation is combined with the allergy eyes. She said I could keep wearing my contacts and gave me some drops for allergies. I'm going to trust the eye Dr over the stupid Urgent Care one I saw. My eye is still bothering me some, but she said that I should try hot compresses to help. Last night John and I went to get ice cream. I was in the office and just grabbed his wallet rather then walk to the bedroom and find my purse. We're in the drive thru at Dairy Queen and I feel this hard round thing in his wallet. Me: Do you have a condom in here!? John: *laughing* No. In fact it's the TOTAL opposite of a condom. Me: *tearing into his wallet* Why's your wedding ring in here? At least for now. I still have some crap to go though out in the garage and who knows what is still with my parents. 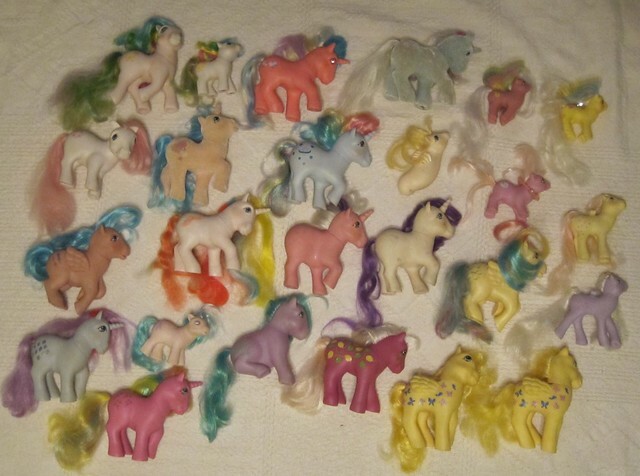 Maybe next week I'll do a showcase of all of the My Little Ponies I found. 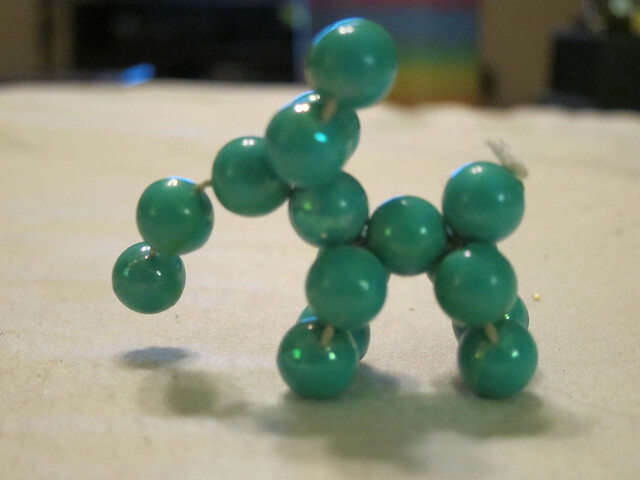 I'm actually going to sell 'em on E-Bay and have already taken the photos. Anyone down for the My Little Pony Parade or will that cause you all to just walk away and never come back here? 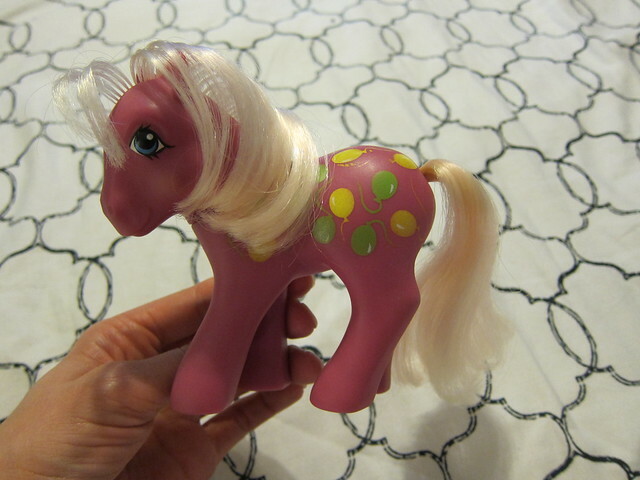 Moving on, unless I've already lost you at the mention of a week long feature of My Little Ponies. 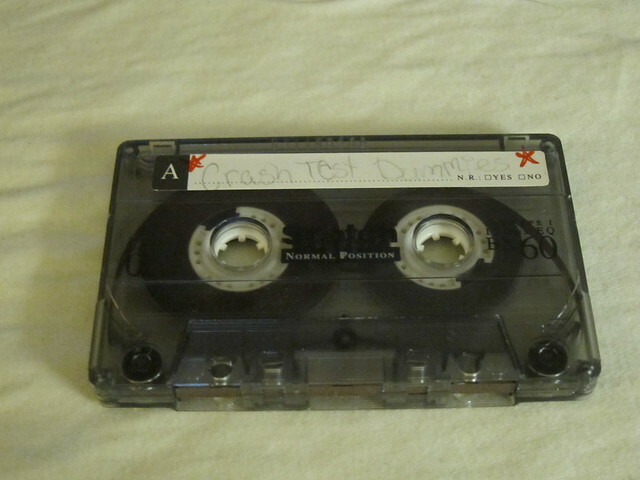 I also found a hoard of cassett tapes. Most I think are ones from band where I had to practice certain scales and counting. BORING. The best of the bunch though? Paul Abdul, Forever Your Girl. Please excuse my misspelling of both Kerrigan and Comeback. I have no idea what this song is. My guess is that it's a spoof on the whole Tonya Harding whack to the kneecap. I also had the Lion King and Pocahantas. I swear I have the Little Mirmaid somewhere. I loved a good movie soundtrack back in the day. In fact, the Romeo and Juliet one was my first CD. O.M.G ya'll! 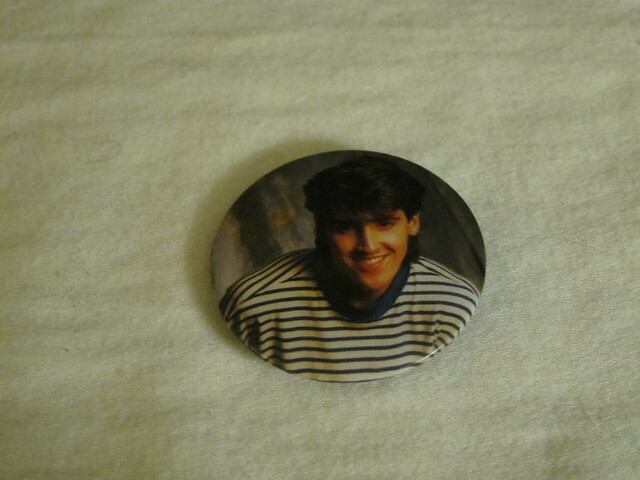 My Jonathan Knight button! I cannot believe I found this. I am SO wearing it to the NKOTBSB concert in June. Oh and yes, I'm going to go see New Kids and Back Street Boys in concert. LOL. 13 year old girl weekend coming up in my future. I may just hang on to these.....not sure. 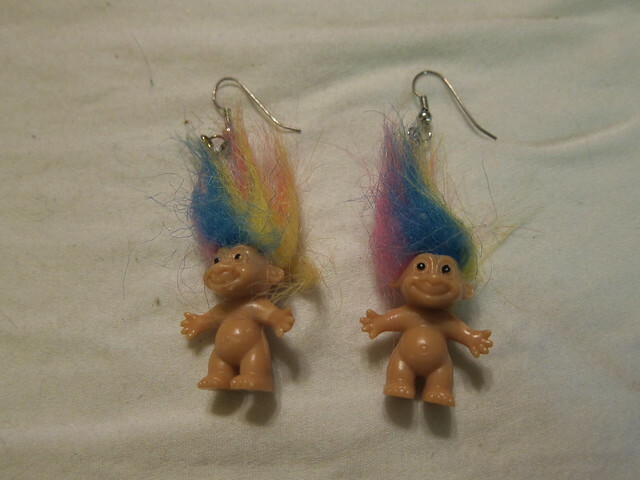 Did anyone else collect trolls? I know that I had a bunch, but I think they're still in my parents' storage unit. I'll do a fashion show whenever they're uncovered. 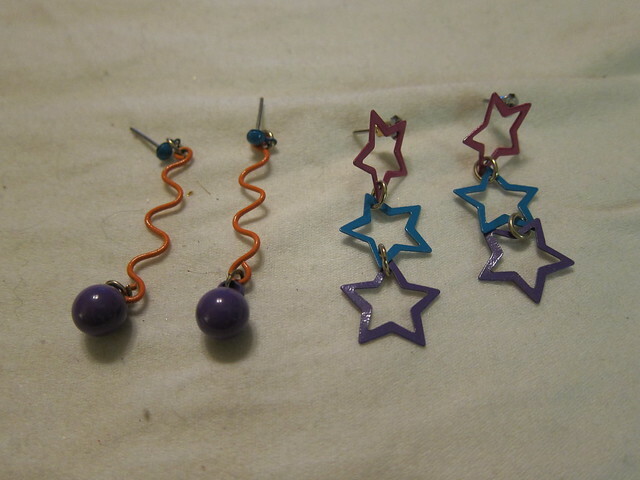 These are some homemade earrings. They're missing their other pairs thankfully, because I'd hate to see either come back into style. 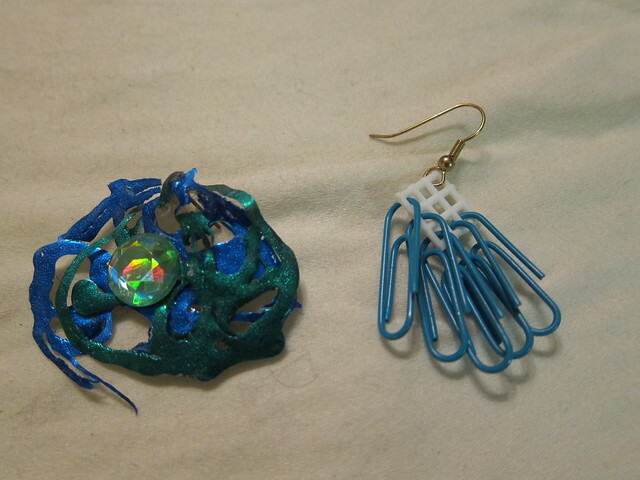 Did anyone else make those paper clip earrings? 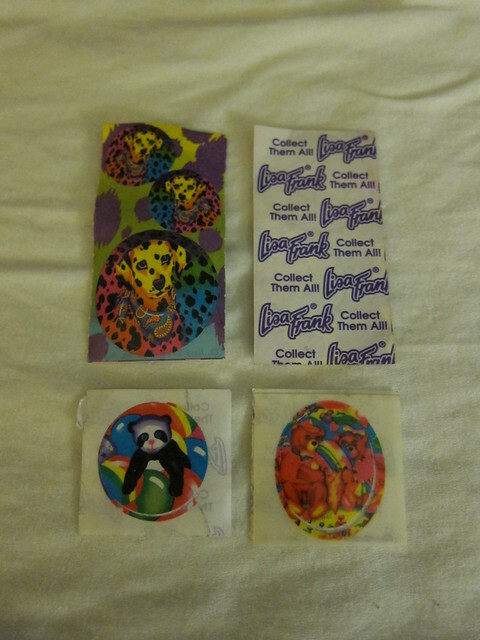 I'm pretty sure I had more than one pair and remember giving some out as gifts. Can you believe I actually wore this to my senior homecoming dance? Oh yeah. HOT. I'll start this one off by saying it's REALLY HARD to take a picture of your own arm. These I wore to my prom my sophomore year. I went with a senior who was also crowned prom king. What's great about this story though is that he wasn't the hottest guy in the school, or the jock. He was honestly the NICEST guy in the school. He was popular because he was involved in a ton of activities and just such a nice guy. He was the one that said Hi to everyone and knew everyone's name and everyone said Hi back, because you knew he meant it and wanted to know how you were doing. Finally, only because it can somewhat be considered jewelry I guess, I found 4 different wrapped packages of beads. Beads. I don't know where they all came from or how I accumulated that many, but wow. 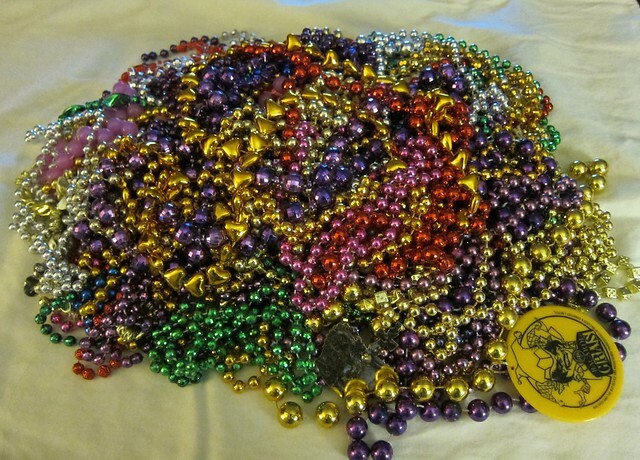 I guess I need to have a Mardi Gras party! 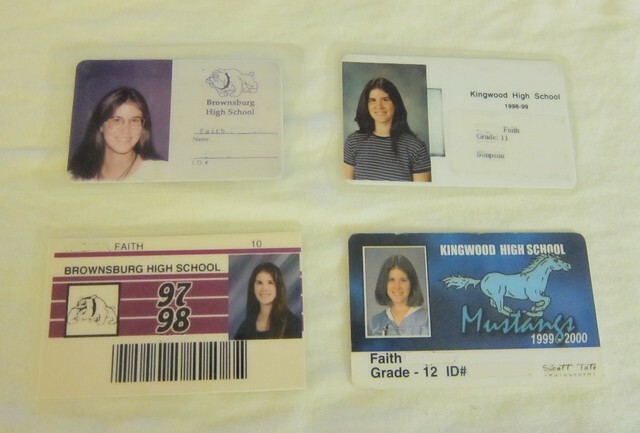 Within the junk I found each one of my high school IDs. Wow. Those were some bad pictures I took. I actually have many more awesome ones from my grade school years. 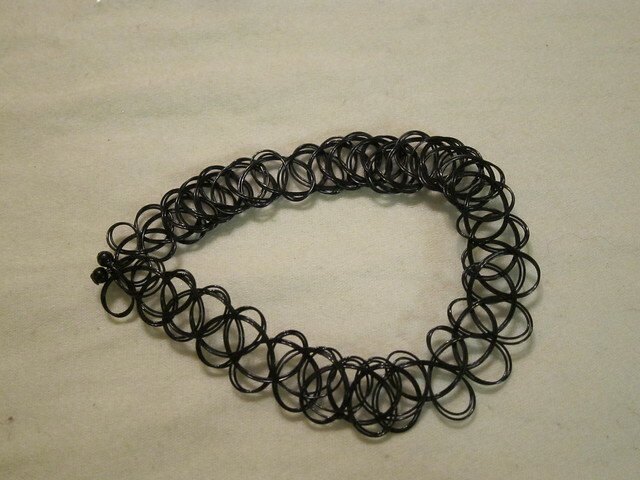 I was REALLY into headbands for a long time. In my Junior year one (top right) John told me I look like a guy that belongs in a Metal Band. Thanks babe. I've gotten A LOT better at pictures since I was in school! 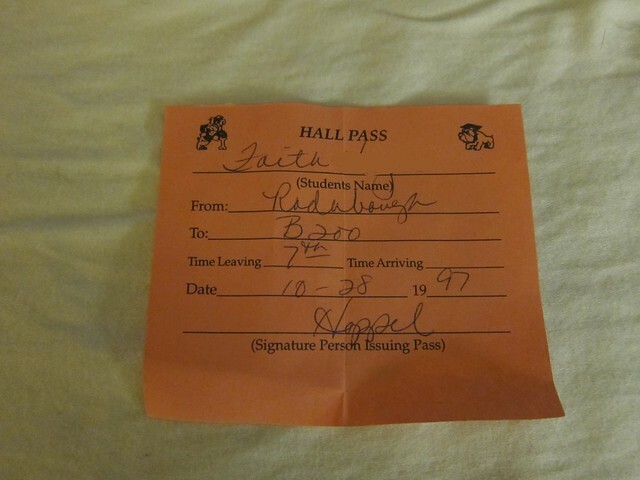 I also found a hall pass from the 10th grade. 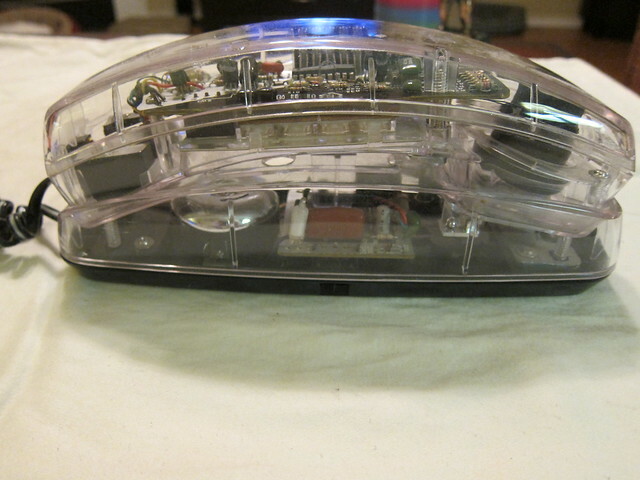 No idea why I still had it or even what I may have used it for. I was only allowed to go to B200 though.